March 20, 2011 - The Teamsters Union and United Airlines Inc. have reached a tentative agreement on a contract for the 5,500 aircraft technicians and related employees throughout the U.S., Teamsters General President James P. Hoffa announced on Friday. This is the first contract negotiated by the Teamsters for the group since the workers voted to join the union in March 2008. ?This tentative agreement marks the start of new day for United mechanics,? Hoffa said. ?This contract makes significant gains in a number of key areas where our members felt they had lost ground in previous contracts. Our negotiating team made addressing these areas their number one priority and did an outstanding job.? Details of the contract will not be released until after it has been presented to and reviewed by the membership in the coming weeks. The union?s negotiation team is currently working on the scheduling of membership meetings and securing a date for the ratification vote. 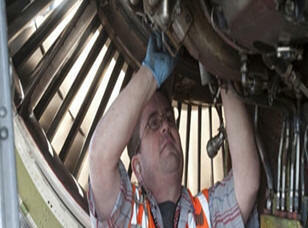 ?This is a historic step in the continuing merger process of United and Continental Airlines,? said Airline Division Director David Bourne. ?I would like to congratulate and commend the hard work and dedication of the union negotiating team, and also want to acknowledge the positive working relationship exhibited by United?s management and negotiators during this two-year process.? On Wednesday Teamsters General President Jim Hoffa told United ramp workers and Continental fleet service workers that the union has committed its full resources to make sure United ramp workers and Continental fleet service workers are victorious in forming their union and winning a strong contract. ?It is great to be in Chicago today at United?s hub, where United workers are joining together with Continental workers to build more momentum in this campaign,? Hoffa said during a workers summit. The momentum keeps building, the unity keeps building, the power keeps building you are on your way to becoming Teamsters. The Teamsters are committed to helping you win this campaign and win a strong contract.? The Teamsters are organizing about 7,000 ramp workers at United, who are currently represented by the Machinist?s Union. Many workers are unhappy with the Machinist?s Union and are turning to the Teamsters for strong representation. The election of the combined group of workers will likely take place this spring or summer. The Teamsters also represent the mechanics at Continental and at United. ?We want a strong and growing aviation union like the Teamsters, not a weak union that is losing tens of thousands of workers in the aviation industry,? said Dennis Turner, a United ramp worker in Chicago.